Everyone uses Google Image Search but most of the time we search images by a text query. That's fine if you know the exact name of the thing you are searching for but suppose if you are planning a trip to say Delhi and you don't know the name of places to visit and if you find something interesting in the image search for the text query 'Delhi', how will you find more details and the more images about it? Either you can waste your time in reading more about image and again type a text query in Google image search or you can use the Google visual image search which is an easier and better way to find images. Even though if you know everything about the images you are searching for you can find more relative images by using the Google visual image search. It is really helpful and you should use it. 1. 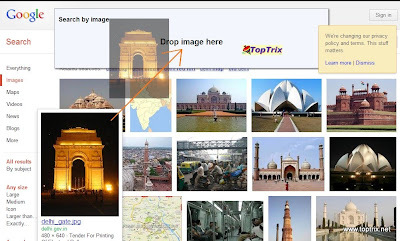 Enter text query about the topic you want in Google image search. 2. After you find an image you want to find out more about, select the image and drag that image into a Google search query input box. While you drag, a small popup box will guide you to drop the image. 3. Get more and relative details about the image, place or anything you want with Google visual image search. This way you can find anything you don't know about. If you have seen an animal and you don't know the name if you want to find more images of the same location and anything like that. You can also find similar images like those you have saved on your memory disk. Google image search allows you to upload the image from your desktop and it will find similar images on the internet. Just click on a small camera icon in the search query box and upload the image and hit search.